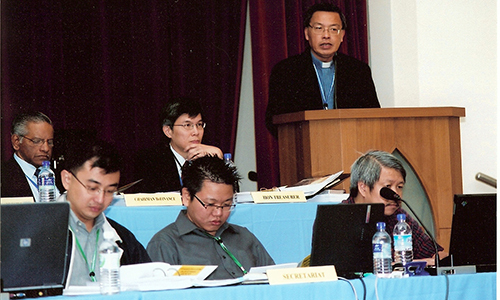 TRINITY ANNUAL CONFERENCE (TRAC) PRESIDENT Rev Dr Wee Boon Hup has revealed that increase in membership has been uneven, and hovered between 1and 3 per cent over the past decade, while the overall percentage ratio of attendance over membership was 87 per cent in the past quadrennium. This, he said, suggests that “we have arrived at a plateau, perhaps because we have not responded to the religious and social needs of society at large”. Independent churches that experience strong growth may stem from their ability to feel the pulse of society and respond eﬀectively. Making this point in his address on Day 2 of the 35th Session of TRAC at Ang Mo Kio Methodist Church on Nov 23, 2010, he said it is relevant to ask what the Wesleyan way might be. Our social outreach to the chronically poor is in keeping with this, although doling out cash is insuﬃcient – we must want to enable them to be financially independent, eventually God-dependent. Resources should be channelled accordingly. Another, and more important aspect, is to stay in touch by listening to what the Spirit is saying to the churches. Wesley discovered that the “causes of the ineﬃcacy” of Methodists can be traced to aﬄuence which begets “pride, love of the world and every temper that is destructive of Christianity”. Related to the statistical survey is the phenomenon of the missing generations – children between late primary and early secondary (“tweens”), youth between graduation from tertiary training about to start work, and others who transit from one season of life to another. These cohorts in transition potentially “transit” out of church. They need to be reached and retained. An important aspect in the last few years has been the establishment of the Board of Children’s Ministry with positive developments such as teaching our children to be intercessors, an important foundation for themselves, but also for the ministries they will grow up to serve. Equally significant is the Seniors’ programme, which has served their needs in discipleship, especially, while the seminars conducted have helped to provide information and skills, for example, in managing financial matters. In a greying society, these can be channels of evangelism. Another area of concern is to recruit new leaders, several of whom have served for more than two quadrennial. A conscious eff ort to nurture, delegate and appoint younger persons to take over in the future must be made. What is true at the local church level applies to Annual and General Conference officers. 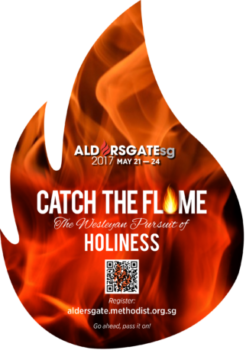 Helpful initiatives include the Young Methodist Leaders’ Conference (YMLC) held annually during the past decade, but will pause in 2011 to allow a reassessment of how young Methodist leaders should confer. Similarly, the TRACkers programme has challenged several cohorts to give their lives to study, serve and demonstrate the dedication of their lives to God. e Pastors’ Development Programme (PDP) will resume in 2011, although with only 20 churches, participants may be unlikely to assume appointment of Pastors-in-Charge, but rather focus attention on developing second-chair leaders. A serious issue is the increase in the number of Members-on-Trial (MoT) in their late 40s and early 50s, and the older they join, the earlier they will retire, joining the cohort of senior elders retiring at the same time. Although there are obvious advantages in accepting more mature candidates as MoTs, more can be done to recruit younger men and women in their 20s and 30s. With the increase in the number retiring in the next four quadrennial, there is an urgent need to act resolutely. to acquire expensive premises. Of course, preaching points have their benefit – the eﬀort forcing the local church to be focused and intentional in its evangelism, while resources can be mobilised to focus on local outreach. is in itself begs the question of starting a preaching point with other churches in the vicinity, and its long-term viability. The term Pastor-in-Charge has a diﬀerent meaning from how it is used in a military setting. In the local church, the test of leadership skill and EQ of the one “in charge” is probably more important than over-achieving goals and executing programmes. Only when the person “in-charge” has built a team of men and women who love, serve and support one another at a community of Christian disciples will they unite in ministry together. Earnest Lau is an Associate Editor of Methodist Message.